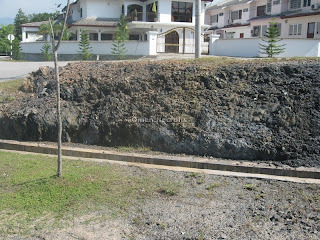 Melange outcrops can be seen in exposed suture zone rocks such as in Bentong and Gua Musang. Bentong-Raub Suture Zone rocks include oceanic ribbon-bedded cherts, argilllites, turbitditic rhythmites, serpentinites and continental margin/shelf deposits (olistostrom). This suture represents the main Paleo-Tethys Ocean which was destroyed by collision of the Sibumasu and Indochina terranes of SE Asia. Melange has a sheared mud/silt matrix containing a variety of clasts such as ribbon-bedded chert, limestone, sandstone, conglomerate, blocks of turbiditic rhythmites, volcanic and volcaniclastic rocks. The clasts range a few mm to several metres and exceptionally up to several hundred metres or more. Clasts of chert have yielded Upper Devonian, Carboniferous and Permian radiolarian, while clasts of limestone have yielded Lower Permian conodonts and fusulinids. 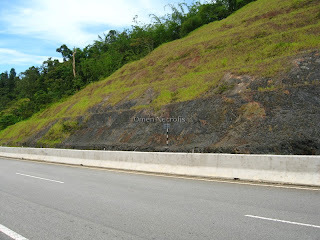 At Krau Satu Road, Raub, limestone clasts yielded Lower Permian (middle Artinskian and early Cathedralian) microfossils.